Our group includes graduate students at UCLA and collaborators enrolled in graduate programs around the world. 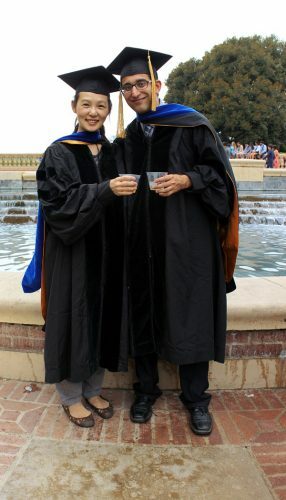 ZarLab alumni Joanne and Farhad at the 2016 UCLA Doctoral Hooding. Prospective graduate students interested in pursuing graduate studies in Bioinformatics at UCLA should apply to either the Bioinformatics Ph.D. program or the Computer Science Ph.D. program. Opportunities for graduate studies include graduate courses and research opportunities. The Bioinformatics Interdepartmental Ph.D. Program offers doctoral training for students interested in undertaking research at the interface of computer science, mathematics, biology and biomedicine to address the fundamental challenges of contemporary data-rich research in biosciences. Our interdisciplinary Ph.D. program consists of an integrated one-year core curriculum, over 50 elective courses, research rotations, and an intensive research experience with one of over 45 faculty mentors from more than 12 departments. The Computer Science Department at UCLA provides one of the finest centers in the world for graduate education offering both Ph.D. and M.S. degrees.